PAGE 6 Island Times May 13, 2014 by Kathi Lewis 850-261-2462Owner Peggy Henshall is ready to keep you in stitches!www.CajunStitchery.com CajunStitchery@yahoo.comnames, logos, custom artsmall or large quantities Marias Fresh Seafood MarketTake a little bit of the Gulf Coast home! Fresh from the boats daily We can cold pack for travel or ship anywhere. 621 Cervantes Street Pensacola 432-4999Call for directions from the Beach Award winning service... Womens Council of Realtors LindaMurphyRealtor@bellsouth.net www.pensacolagulfbreezehomes.comindependently owned and operatedIsland Times Blogwhere shelly waters meet sandy beacheswww.myislandtimes.com Mve In ecias Climate Controlled Self Storage Drive Up Access Boat Parking Moving & Packing Supplies24/7 Digital Surveillance Safe, Clean & Secure Great Rates Professional Managementsmartstopselfstorage.com15 McClure Drive Gulf Breezeformerly Storage Advantage 45 A Via de Luna 934-4848 Serving Breakfast & Lunch 7:30 am to 3 pm Homemade SoupHot fresh soups daily Gumbo Red Beans Shrimp ChowderMaybe its just me, but it sure seems like weve had our share of bizarre weather this year. (I still say this year because I cant believe its May already!) It was the last week of January when the Ice Blizzard Cometh upon us. I remember because I had possession of all four tickets to get my sisters and me into the Merle Haggard Concert in Jacksonville. It was late Thursday night before Husband Bill and I were able to leave for Georgia (in my beloved Caddy with no heat, something that I rarely need anyway) in temperatures ranging in the low 30s and below. We were bundled up to the max, including hats and gloves. At one point, I pointed out to Bill that it was only my body temperature (something that ranges between Raging Inferno and Ice, mostly inferno) that kept Ole Blue from freezing inside the car. We did get some frost at times, but all I had to do was touch it with my hot little hands (which also helped cool them down). Of course, there was the added concern of not knowing if the roads ahead of us would be covered with ice and our route is mostly very dark two-lane country roads through very small towns from Dothan to Albany. We did get to Albany in time to sleep a couple of hours before leaving for Jacksonville. When the school closed for the Ice Blizzard, granddaughter Sissy (Quincy Rowe) made her debut as a playwright. Bill and our dog Peanut were the audience and the play began with us meeting in a coffee shop. After a long separation, we found each other again and were delighted to discover that we were long lost Mermaid sisters. The play was quite detailed and required two costume changes. We received a standing ovation with lots of applause and a little bit of barking (from Peanut, not Bill). Before I get to the more School activities, I have to say end of the weather tunnel. It came with a full day of glorious sunshine and the most beautiful beach wedding I have ever seen and heard. James Winstead, son of my dear friends Courtney and Jim Winstead travelled from California to marry the love of his life Debbie Campana. James spent more than a few days cleaning Mom and Dads garage and sun Everyone was praying for sunshine for their Wedding Day and our prayers were answered loud and clear. Debbie was a radiantly glowing bride full of love and beauty. And by the time she and self-written vows, there wasnt a dry eye left among their guests. So much love with family and friends all set against the perfect background of the Gulf of Mexico. I know the pictures will be incredible. They also held a truly special magical reception with a guest photographer (who brought his own props for guest photos) and music by Boogie, Inc. with our own Bonnie McDonald. The evening was comworks exploding over the beach. I hope they carry that same love and devotion to each other throughout their marriage and hold it in their hearts every day of their lives together. It was truly an honor to share their special day. so, school was once again closed due to another weather disaster in our area. Grandson Jesiah called our house around 3 a.m. on April 30 to tell us their house nice pictures of the water rushing down the hall like a river. I swear, it looked like there was a current. He also got a beautiwas their neighborhood. Bill drove over in his big Suburban to bring the kids to our house while daughter, Mel stayed to clean and save as much as possible from their waterlogged belongings. Of course, they were both delighted at the prospect of ny and Pappy instead of going to school on Thursday. Sissy tapped into her wonderful imagination again and decided to open a restaurant with all her play food and cooking equipment. She organized all her food and utensils, set up her table and dishes then created the restaurant sign: The Kitty Kitchen. After designing her extensive menu (complete with pictures of some of her desserts), she was open for business. Since she wasnt very busy at the time, she chatted with me about her business explaining she grew her own ingredients in a garden out back. After sampling one of her unique recipes, I mentioned that I just happened to write a cooking column for the local newspaper. We chatted some more and I asked if she would be interested in sharing one of her recipes with my readers. She was delighted and agreed immediately to share her favorite (a big seller ... by the way). Ms. Rowe, explained that her nickname was Kitty and therefore the reason behind the restaurant name. She not only grows her own ingredients, but is also a member of a Co-Farmers Organization where they trade products. She explained that she grew more vegetables than she could use, so they were very useful in trading for ingredients she didnt grow such as meat and dairy products. This keeps her food cost very low and makes What a clever idea! She is hoping to expand her business with the introduction of seating in the beautiful garden space. Since shes been very busy adjusting to life after a storm, I havent had a chance to re-visit the Kitty Kitchen. But I did get her recipe to share (written in her own words) and I hope you enjoy it as much as I did. This is cake. So, lets cook.. The resipe for fruit cake is two rassberrys: one black and one red. Take regilor cake mix and add 2 teaspoons each of red and black rassberrys. When your done making the cake. Put whipcream on the top. Put the rassberrys side-to-side on the top. And well-a (pronounced viola)! Enjoy, dont forget to share and please help a neighbor if you can. May is Military Appreciation Month. Please say thank you to our active duty and veterans when you see them on the beach. It takes but a moment and means a great deal. (I can hardly wait for our next Weird Weather Adventure with my friends and family.) See ya in the kitchen..
Island Times PAGE 7 May 13, 2014 Worship by the Water, 9 AM Flounders Beach www.gbumc.org Our Lady Catholic Church, 9:45 AM Avenida 18 /Via De Luna www.stanngulfbreeze.org Pensacola Beach Church, 10 AM Avenida 18 /Via de Luna thebeachchurch.com Central Waterside Church, 9 AM Bimini Beach Bar Jennifer Byrom, P.A. Wills, Estates and Probate Marital and Family Law Child Custody Juvenile Law Civil Litigation Guardianship LawThe hiring of a lawyer is an important decision that should not be based solely upon advertisements. Toll Free: 877-889-8822 5177 Elmira Street Milton Facing the Courthouse916-9000 By Cross in the Sand A850-206-3156 Joe Stukey Computer Repair in Your Home www.ycpals.com joe@ycpals.com There are times that it is always good to reach into your memory and share something that is very near and dear to you. The following is an Old Jewish Tale as I heard it many years ago. The last line is mineI hope you enjoy. Once there were two brothers who inherited their father's land. The brothers divided the land in half and each one farmed his own section. Over time, the older brother married and had six children, while the younger brother never married. One night, the younger brother lay awake. It's not fair that each of us has half the land to farm, he thought. My brother has six children to feed and I have none. He should have more grain than I do. So that night the younger brother went to his silo, gathered a large bundle of wheat, and climbed the hill that separated the two farms and went over to his brother's farm. Leaving the wheat in his brother's silo, the younger brother returned home, feeling pleased with himself. Earlier that very same night, the older brother was also lying awake. It's not fair that each of us has half the land to farm, he thought. In my old age my wife and I will have our grown children to take care of us, not to mention grandchildren, while my brother will probably have none. He should at least sell more grain from the fields now so he can provide for himself with dignity in his old age. So that night, too, he secretly gathered a large bundle of wheat, climbed the hill, left it in his brother's silo, and returned home, feeling pleased with himself. The next morning, the younger brother was surprised to see the amount of grain in his barn unchanged. I must not have taken as much wheat as I thought, he said, bemused. Tonight I'll be sure to take more. That very same moment, his older brother was also standing in his barn, musing much the same thoughts. After night fell, each brother gathered a greater amount of wheat from his barn and in the dark, secretly delivered it to his brother's barn. The next morning, the brothers were again puzzled and perplexed. How can I be mistaken? each one scratched his head. There's the same amount of grain here as there was before I cleared the pile for my brother. This is impossible! Tonight I'll make no mistake I'll take the pile I'll be sure the grain gets delivered to my brother. The third night, more de termined than ever, each brother gathered a large pile of wheat from his barn, loaded it onto a cart, and slowly pulled his haul to his brother's barn. At the top of the hill, under the shadow of a moon, each brother noticed a figure in the distance. Who could it be? When the two brothers recognized the form of the other brother and the load he was pulling behind, they realized what had happened. Without a word, they dropped the ropes to their carts and embraced. It is said that this is where God put his finger, and said Build an alter here, because my house is a house of love and giving. PAGE 8 Island Times May 13, 2014 The Lizzards Tongue... Sometimes you never really know your neighbors until tragedy strikes. We've been very fortunate on Pensacola Beach and Mother Nature has spared us her wrath for quite some time. But she hasn't always been so kind. I met my Gulf front neighber of 1979. Ms. Brooklyn and her husband, Mr. (Bill) Miller, were just a few cars ahead of my mother, Jane Waters, and me ing to return to the beach after Hurricane Frederic. Word of mouth, like a giant game of tele phone operator, was trickling back in regards to the damage that Frederic had levied on our beloved barrier island. I heard Ms. Brooklyn say, My little red brick house is completely gone. It's washed up into my neighbor's front yard. Those words sparked an instant introduction and the beginning of a lasting friendship between two families that would span generations. For years my mother watched over Bill and Brooklyn's house as their main residence was in Baton Rouge, Louisiana. When their older children vacationed in the family home with the grand kids, I was just a teenager and would walk across the street to babysit. In fact, Bill and Brooklyn's held. (In case you are wondering who the other four are -in or der -Jeremy Johnson, Lindsey Stanley, Harry Hewson, and Barrett Johnson.) Her pool was always open to them. Their Gulf front balcony and walk over was ours to use. My husband, the Colonel, proposed to me on the Miller's beach front. The pictures were taken on their balcony. Together our families have been through the celebrations and tragedies of life, always catching up via a phone call or their annual visits to the beach. And though the sands in the hour glass have shifted, both homes have remained in the families, but with new owning over Mike Miller's home. His grandchildren, Stella and Mercer, the daughters of William and his wife Jennifer, are swimming in my pool. We have come full circle. So it was no surprise that after the latest storm, Mike and I checked in with each other. I was very relieved to report that couldnt bring myself to tell him was that I had spent hours cleaning up the contents of his trash over, and then spewed its contents. His wife, Mary Helen, who I have only met once, and her friends had just spent a couple of days on the beach and left the Monday before the storm. As I waded through standing water, grateful that this was all I had to clean up, I thought to myself the next time Mary Helen comes down, we need to get together. I truly appreciate a woman who eats fat-free, low calorie chips and two bags of Ghirardelli chocolates. I learned a lot about her and her friends as I returned the wet, bedraggled garbage to As I thoroughly secured their trash bin, I really didn't want to pick up its contents for a second time, it dawned on me that in a sea of weekly rentals, I am very fortunate to have neighbors whose friendships I cherish, even if I only see them a couple of times a year. Until next time... Third and fourth generation Millers continue to enjoy Pensacola Beach. William is the grandson of Bill and Brooklyn Miller. He and his lovely wife, Jennifer, venture to the beach at least once a year from Baton Rouge with their children, Stella, 3, and Mercer, 18 months. Babs, the family dog, has been making the trek for the past 10 years. PAGE 9 Island Times May 13, 2014 Did you see me in IT? Check out our photo gallery online www.MyIslandTimes.com Beautiful gulf front lot located within walking distance of dining shopping and all activities. Build your dream home and enjoy your piece of paradise. MLS 461377 $549,000Professionals and amateurs will mold the fine white sands of Pensacola Beach into works of art during the Fiesta of Five Flags Sand Sculpture Contest Sunday, May 18. The contest will take place on Pensacola Beach directly south of the Gulfside Pavilion. Registration begins at 8 a.m. and judging at 2 p.m. The competition is free and more than $1,900 in cash and prizes will be awarded. The public is invited to vote for their favorite sculptures in the Peoples Choice Awards. Organizers will have additional activities available beginning at 10 a.m. The judges have one hour to review the youth, teen and adult entries prior to making their decision. The winning sculptors will be announced and judges will be introduced at 3 p.m. For more information, visit fiestaoffiveflags.orgSand Artists To Compete Pensacola Beach Womans Club has a lot to celebrate. During their Sixtieth Anniversary Luncheon at the Beach Church Fellowship Hall, April 17, the Club recognized birthday girls (L to R): Kim Harvell, Nancy Teston, Pam Jewell, Joanne Brooks, Mildred Price, Orlena McKenzie and Diane Arnold. PAGE 14 Island Times May 13, 2014 CLASSIFIED ADS are $5 for 20 words. Additional words are 10 cents each. Send ad with check made payable to Shelley Ink, P.O. Box 844, Gulf Breeze, FL 32562. Calendar31: DeLuna Landing Fiesta of Five Flags, Boardwalk Amphitheatre. 3pmJUNE1: Mere Mortals triathlon training group. 6 a.m. trigulfcoast.org 1: Wooly Booger Keep The Hurricanes Away This Season Bawl, 3 p.m. Paradise Bar and Grill. No charge. Open to all. 1: Country Sunday, Boardwalk, 4 pm 3: Bands on the Beach. Gulfside Pavilion. 7-9 pm www.visitpensacolabeach.com 5: Sunset Tri, Portofino. TeamMPI. com 6: Stargaze, Casino Beach. Dusk, weather permitting. Free. June 7. 7: Fishin Chix Rubber Boots Tourney, Flounders Beach 7: Florida Trail Days Walk, 6:30 pm Ft. Pickens 8: Bananimals Luau, Sandbar, 3 pm. Pay at the door. 8: Mere Mortals triathlon training group. 6 a.m. trigulfcoast.org 8: Country Sunday, Boardwalk, 4 pm 10: Bands on the Beach. Gulfside Pavilion. 7-9 pm Real Estate For SaleCLASSIFIED ADVERTISINGPensacola Beach Vacations Rentals. Call for the BEST RATES on Beachfront condos and beach homes. Toll Free 800-242-3224. Visit online gulfbluevacations.com Real Estate For Rent This lovely home is a must see, so well maintained you can move in without doing a thing. 4BR/3BA. 2,659 SF. $199,900. MLS 454942 Upon entering the wide foyer you will see the nice size dining room. The large eat-in kitchen is a cooks dream, featuring an island, breakfast bar, pantry and a built in desk, plus room for a kitchen table. Enjoy sitting outside in the 12x20 Florida room or grilling on the covered patio. Call Linda Murphy, Keller Williams Realty 850-748-0865 Two residential lots sold together for $34,000. Well over a half acre lot. Located off Oriole Beach Road in Gulf Breeze, just blocks away from the public pier and boat launch. Build your dream home today! MLS 4456772 Call Linda Murphy, Keller Williams Realty 850-748-0865 MLS# 458584. Four Bedroom/Three Bath home in desirable Pensacola location. $219,000. Enjoy swimming in the pool or watching the kids play in the large backyard. Call Linda Murphy, Keller Williams Realty 850748-0865 $890,000 Beauty on Bay Street. 3/4 3,097SF. 2759 Bay Street. Gulf Breeze. www.denrem.com Dennis Remesch, Re/Max on the Coast, 850-384-7607. $32,900. Gulf Breeze Lot .41 acre. Real Estate For Sale Check out my website for additional residential lot listings. www.denrem. com Dennis Remesch, Re/Max on the Coast, 850-384-7607. $222,000. Navarre. 4/3 home on Soundhaven Court. New Construction. 1850 SF. Dennis Remesch, Re/ Max on the Coast, 850-384-7607. $69,900 3/2 Manufactured Home in Navarre. 8430 Tortuga St. 1782 SF. www.denrem.com Dennis Remesch, Re/Max on the Coast, 850-384-7607. Four Bedroom Gulf front Townhome. Great rental history. $479,000. Jeremy Johnson, Sales Manager, Levin Rinke Resort Realty. 850-377-3145 JeremyJohnsonRealtor.com Waterview Lot. 320 Deer Point Drive, Gulf Breeze. Exclusive Gated Neighborhood. $125,000. Contact Jeremy Johnson, Sales Manager, Levin Rinke Resort Realty. 850377-3145. 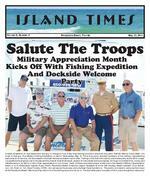 Call a professional who advertises in Island Times!MAY13: Bands on the Beach. Gulfside Pavilion. 7-9 pm www.visitpensacolabeach.com 14: Military Fishing Expedition. Sponsors Needed. Beach Chamber, 850-932-1500. 15: Hot Rods, Paradise Inn, Thru 5/17. 17: Pensacola Beach Triathlon, 7 a.m. Casino Beach. 17: Hands Across The Sand, Casino Beach, 11 a.m. 18: Three Mile Bay Swim, 7 a.m. 18: Fiesta of Five Flags Sandcastle Contest, Casino Beach, all day. Judging at 2 pm 20: Bands on the Beach. Gulfside Pavilion. 7-9 pm www.visitpensacolabeach.com 22; Harley Davidson Garage Party, PensacolaHarley.com 23: Free Trolley Service begins 25: Country Sundays, Boardwalk, 4 pm 26: Memorial Day 27; Beach Chamber Membership Meeting. Upper Room Coffee Shop, 8:30 a.m. Guests call 850-932-1500. 27: Meet Carolina P. McMullen, author. Book Signing, Springhill Suites. 11-1 and 3-5. Also May 28, 29, 30 27: Business After Hours, Shaggys. Guests Call 850-932-1500. 5:30 to 7 pm 27: Bands on the Beach. Gulfside Pavilion. 7-9 pm www.visitpensacolabeach.com 28: Santa Rosa Island Authority Meeting, 5 pm. #1 Via de Luna, Open to the Public. www.sria-fla.com 30: Last day of School Volunteer Opportunities Are you a dirty dog? Pensacola Humane Society Doggie Bathe In Schedule. Saturdays from 9 a.m. until 2 p.m. on May 17, June 20, July 19, August 16, September 20, October 18. Bring your own towels. Prices start at $7. 5 North Q St, Pensacola, 32505. PensacolaHumane.org NAME:_____________________________________________________ ADDRESS: _________________________________________________ CITY: ________________________________________________ STATE: ____________ ZIP: ___________ Caution: Reading Island Times can result in spontaneous moments of unbridled joy Send $32 to get yours by mail Shelley Ink PO Box 844 Gulf Breeze, FL 32562-0844 available online all the time at MyIslandTimes.com Island TimesPlease recycle Share this newspaper with a friend Pets WE LOVE LEASHED DOGS! Protect your pet, walk them daily on a leash. Pick up their waste and encourage good dog ownership. Woof! Pensacola Beach Dog Parks. Daily, 7 to SUNSET. Leashed, friendly dogs. Parking Lot E located near park east and Parking Lot B near park west on Fort Pickens Road. BEACH CHURCH BINGO 1st and 3rd Thursdays, Bingo $20 at 7. Be a key ingredient for the success of the Pensacola Beach Chambers Taste of the Beach 2014. Sign up as a volunteer. T-shirt and goodie bag. Dont miss the opportunity, September 19-21. www.TasteofPensacolaBeach.com. PAGE 17 Island Times May 13, 2014 ARE YOU READY?We understand your insurance needs!850-623-8092CALL US TODAY FOR A QUOTE family owned and operated independent insurance agency Life, Business Auto & Motorcycle Commercial Vehicle Homeowners & Flood www.bayins.com bay@bayins.comBusinessBuzz Are You Kidding? Bytes & BitsBy Joe Stukey, Your Computer Pal Q: What are the features of the Apple iPad Air? A: The iPad Air is a great little device. It is little, in that it only weighs one pound. It is only 7.5 millimeters (.29 inch) thick. The Apple products that are labeled Air represent Apples most lightweight product lines. This one is 28% lighter and 20% thinner than its predecessor. It is 9.4 inches by 6.6 inches -the same size as the regular iPad. With the Retina Display and LED backlit screen, you get very high quality images. and Cellular options for getting With two built-in antennas, Inter net access is much faster (maybe twice as fast). It has the latest 64-bit processor, known as the A7 chip, which is also said to be twice as fast as its predecessor. The Siri lady (or guy) can be activated by holding down the Home button. She can look information up for you, leaving you hands-free to do other things. Want to know the population of Miami? Just ask her. Or ask her to take you to a certain location. She can guide you to the location, or can provide you with a road map on the screen. The built-in Maps program will also do that for you. And, unlike the iPhone, you can see it without squinting or stretching the image. The Pages program allows you to create documents. It will also open and edit Microsoft Word documents. You can save Pages documents as Word documents and send them to Windows users. There are at least a half million other Apps that work with the iPad product line. One thing that the iPad Air cannot do..make a phone call. That still remains the job of the iPhone. However, the Messages program allows you to send instant messages to anyone using an Apple product. The cost of the iPad Air ranges from $499 to $929, depending on the capacity of the hard disk (16gb to 128gb) and the type of internet or Cellular). This article was provided by The Stukey Group. For questions, contact Joe at joe@ycpals. com or 850-206-3156.BEST BARThe electrons bounced around as beach bums voted online for their favorite beach bars across the state. FloridaBeachBar. com announced that Pensacola Beach is home to two of the top ten vote-getters. Paradise Bar and Grill earned seventh place and the Shaker, home of the original Bushwacker, scored tenth. Clearly, you need to visit them for a congratulatory drink. THE GIFT OF STITCHIf the graduation and wedding invites are stacking up in your mailbox, call Peggy Henshall at Cajun Stitchery, 850-2612462. She will make the ordinary extraordinary, personalize almost anything or help you create a keepsake item for the happy bride or rad grad. BOTTOMS UPTheres no bottom to the $6.99 glass of bubbly served at Crabs during Sunday Brunch from 10 a.m. to 2 p.m. Float away on the island vibes of Pensacola Steel Band. Intoxicating Gulf front views, too. GIVE AWARDMississippi Governor Phil Bryant awarded Shaggys a GIVE Award for Community Excellence. They have a Shaggys Kids Foundation, conduct food drives at Thanksgiving, sponsor charitable outreach locally and inter nationally. Way to go, Shaggy. BEADS, PLEASEIts Fiesta time. In addition to the Sandcastle Contest hosted on Pensacola Beach, May 18, and the DeLuna Landing, May 31, the Fiesta of Five Flags brings a parade to downtown Pensacola Thursday, June 5. Do you have beads yet? Pensacola Parade People are stocked and have summer specials. Find out more at paradepeople.com, or 850-696-7566.ADDING ADVOCATESPensacola Beach Advocates Membership guru Maria Weisnicht is determined to meet her goal of 500 paid members. Shes eclipsed last years goal, and is closing in fast. The PBA has been instrumental in keeping members informed about taxation issues. Go ahead, make Marias day. Join PBA. Go online to pbadvocates.org and sign up. Its just thirty bucks.SPORTY ous athletes, weekend warriors and fashionistas. They are located at 3009 Cervantes Street, look for the kayak out front. LEARN TO SURFInnerlight Surf Camp hits up fast. Sign up at innerlightsurf. com, dude. Sandee Bredesen, a retired educator, has been chuckling for thirty years about the funny things kids say and do. I was teaching arrays in math drawing small squares or dots to represent 3 x 4. The students were to follow my model. One boy spoke up and said, Mrs. Bredesen, I cant do this. I am not very good at art. On my last day teaching before retirement, I wore a disguiseglasses, big nose and eyebrows and a mustache. As always, I greeted students on the stair landing. One student who I saw daily came up to me and asked, Who is you is? When I spoke his name, he responded, Oh you is Ms. Bredesen! PAGE 18 Island Times May 13, 2014 Call Dennis Remesch850-384-7607 www.denrem.com denrem@denrem.com 4/3.5 High end features and attention to detail. $999,900 MLS #448434 Stunning Gulf Breeze Waterfront Home By Charles Gheen USAT Never Hurts To Tri 49 Via de Luna 916-9808 Happy Hour Mon-Fri 11 to 7 Gail Walsh Massage & Skincare Co.913 Gulf Breeze Pkwy Harbourtown #31Gail Walsh Owner/Operator MA#31796 MM#29635 Check out our services and prices atGailAWalsh.comCall 850-261-5678 for current specials! Texas Hold Em 4444 Fun 850-324-2667 Monday: Sandshaker, 7 Tuesday: Sabine Sandbar, 7 Wednesday: The Islander Lounge, 7 Thursday: Paddy OLearys, 7Back To The BlastTwo weeks ago I traveled again to the quaint hamlet of Mexico Beach about 25 miles east of Panama City. Its a small town on the Gulf of Mexico that has about 1100 residents, motels, bed and breakfast inns and several Mom and Pop businesses. St. Joseph Bay is southeast of Mexico Beach and the St. Joseph Peninsula has served to protect this area from hurricanes over the years. Farther east on the coast are Port St. Joe, Cape San Blas, and Apalachicola. We went there to run in the Beach Blast Triathlon and Duathlon which is an eclectic set of multi-sport events held twice a year at Beacon Hill Park. The event consists of Sprint and Olympic distance duathlons (runbike-run) and triathlons. For me its the perfect early season race see if Ive done any worthwhile training at all. The water temperature also marks the boundary of wetsuit/no-wetsuit swimming. USA Triathlon rules state you can wear a wetsuit at 78 degrees or less. The water temperature for this race was 73 degrees so it was wetsuit legal. On the morning of the race I got up at 4:30 a.m. and shaved. Thats another of my superstitions: I cant run races feeling grungy. I put on one of my triathlon kits (quick-drying synthetic tank top and matching compression shorts that you wear for all three disciplines) and pinned my number to the shorts. Im a minimalist and dont carry a bag into Transition. I had on my running shoes, my swim goggles were around my neck, my Oakleys, bike shoes, running hat, swim cap and gum were crammed in my helmet and my sports drink was in a bottle on my bike. I was still groggy as I wheeled my bike to the elevator. Down in the lobby I got coffee, had some peanut butter and whole-wheat toast and made an extra piece to carry with me. Coffee has caffeine which is a legal ergogenic meaning it will enhance your performance a little. I was just trying to wake up and remember to chew my food carefully. I also grabbed a banana as I went out the door and put my bike on the car. By the time we got there I had eaten the extra toast and the banana so I was certainly fueled up. I racked my bike in Transition, arranged my equipment on the ground and walked to the beach, goggles and swim cap in hand. It was overcast, but the sun was breaking through in the east and it was a glorious morning that would turn hot during the run. but I didnt wear one because it was too much trouble for the short 400-yard swim. I had been swimming for almost two weeks at Pensacola Beach without one and the water didnt feel THAT cold. The race began and I was out laboring very much. I was somewhat surprised and was thinking that the swim was going to be easy until a guy ran his head hard into my hip. I was jolted back to the moment at hand. I pushed him away with my foot, scrambled through the crowd at the second buoy and turned for the beach. As I drug myself out of the water, I looked at my watch. Slightly more than 7 minutes had elapsed, so it was a good swim. I was winded, however, as I began the long jog up to my bike. Buckling my helmet I ran my bike towards the mount line and soon started pedaling. My transition was long and I started slowly. I was soon moving ahead smoothly and made the turn north off the main highway at the one-mile mark. From there its another 6 miles to the bridge which is a tough climb. I made it up okay and then sped down towards the turn around point. On the ride back into the wind, I slowed down appreciably and was fatigued when I got off and ran towards my rack again. As it turned out the bike was the highlight of my race. The run wasnt that pleasant due to the heat and my lack of conditioning. You have to train properly to get off the bicycle and run well and I just hadnt done that. I swallowed down a pack of GU at the beginning of the run, but that helped very little. The race dragged on and eventually I ran up the hill to the park, turned left down the finish chute and soon crossed the line. I actually did beat several guys in my age group, but the two athletes in front of me were well ahead. The Beach Blast was in the books and I had training. I have hard evidence of that now and have resolved to be more disciplined. Well see. This is my twenty-seventh triathlon column for the Island Times. At least I started out writing about triathlon, but Ive branched off into road races and a few other athletic events. Ive written from the perspective of a participant, a race director, a volunteer and an interested observer. It has been an enlightening experience as Ive learned several things and gained some insight. Much thanks to the Times for this opportunity! Brent Baadle, 9, won his age group at the Run for Their Lives 5K, on Pensacola Beach, April 26. His time was 25:38. Runners out front at the beginning of the Run For Their Lives 5K on Pensacola Beach, April 26 are (L to R): Rusty Branch, Matthew Babikow and Danny Goodman. Goodman won the race in a time of 16:48. Branch was 18:50. Island Times PAGE 19 May 13, 2014 By Terri McKamey Men & Womens Casual & Outdoor Clothing Hiking & Backpacking Gear Snow Ski Apparel Rock Climbing Gear,Ropes & Shoes Kayaks3009 East Cervantes 433-2822 HATS 3009 East Cervantes 433-2822Hiking & Backpacking Snow Ski Apparel Rock Climbing Gear, Ropes & Shoes Indoor Rock Climbing Wallwww.weatherfords.net Men & Womens Casual & Outdoor Clothing Hiking & Backpacking Gear Snow Ski Apparel Rock Climbing Gear,Ropes & Shoes Kayaks3009 East Cervantes 433-2822 HATS Mens and Womens Casual & Outdoor Clothing One Stop Shop for the Watersports EnthusiastsFeel the Thrill ~ Join the Club! You wont stop smiling even if you tryPensacola Beach at the BoardwalkSALES & RENTALS 850-932-5520 www.KeySailing.com OPEN 9 to 6weather permitting Rentals Include: All safety gear Expert instruction Ask about eco kayak tours paddle boardsNEW! Video Your Vacation. Waterproof Cam June 21-22 Pensacola Bud Light Fishing Rodeo Flounders Beach 731 Pensacola Beach Blvd across from the Boardwalk Mondays Specials all Day! 1/2 price BARE, 10 am til close. Texas Hold Em 4444Fun & Trivia, 7 PM Tuesdays 8pm to Midnite Karaoke with Becky Wednesdays 8pm to Midnite Get The Horn Thurdays T-shirt Nite 1/2 price drinks w/Shaker Shirt, 7 PM to close. After Midnight 8 PM Sundays 9 pm to Midnite Karaoke with Becky Sandshaker.com 850-932-2211 Sat, May 17 3-7 Hannah Wallace Shaker Deck Get a Shaker T-Shirt Great Drinks at Great Prices since 1973! its always Shakin! Its Shaker Time! Sat, May 24 3-7 One World Beach & Steel Drums Shaker Deck Fri & Sat, May 16 -17 Flock of Sea Monkeys, 9 Sun May 18 Lektic Mullet, 4 Fri & SatMay 23-24 Ultra Violet, 9 Sun May 25 Dunnottar, 4 Sandshaker.com Dunnottar, 4 Voted Top Ten Florida Beach Bar! Right now everything is in such abundance I dont know where to start. You can catch just you can just about choose your And, dont forget Jacks. catch of the day, right now, but the corner. The 2014 season starts biting. So what are you waiting The Entertainer Captain Rusty Smith sent this photo of Urban Meyer, Ohio State football coach holding a nice scamp the Big Zulu. According to Capt. Rusty, the water has warmed up, so his Entertainer charters have been catching the limit in 44 pound Amberjacks. Scamp Grouper are in depths of 180 to 250 feet of water. Amberjacks are plentiful on some of closer public wrecks and the Mingo Snapper are chewing the hooks off! Jeff Scomp, left, and Zach Taylor are well-seasoned anglers. Check out their catch.